Carefully choosing the correct bicycle frame size for your height and body type is crucial to your riding experience. The frame size affects your agility, power, speed and bike-handling ability, and it is also a matter of health as a poorly chosen frame can cause you discomfort and injury. While sizing a bicycle is not an exact science, there are guidelines that you can use as a starting point for your selection process. When it comes to bikes, total body height is a bad indicator of the ideal frame size. Instead, inseam usually serves as the determining factor of the correct bicycle frame size. Keep in mind that all bodies are not the same. Some people are sitting giants with a short inseam and long torso, while others have long legs and short torsos. And since cycling comfort is largely influenced by how well the legs can do their job, inseam is what matters most in sizing a bicycle. To determine your inseam, take off your shoes and stand tall against a wall. Place a large book between your legs in the crotch area, then have a helper measure the distance from the top of the book to the floor. This measurement is your inseam. Since road bicycle frames are sized in centimeters instead of inches, you need to multiply your inseam measurement by 2.54. Then multiply your inseam in centimeters by .67 to determine the frame size. For a mountain bike or hybrid, no conversion is necessary as these bicycle types are measured in inches. The frame size refers to the length of the seat tube, which is the rather upright tube that holds the saddle post. But for a comfortable ride, you also need to find the ideal top tube length. The top tube is what cyclists call the crossbar that connects the seat to the handlebar. According to bicycle mechanic Sheldon Brown, the top tube is even more important than the seat tube because modern seat posts are sturdy enough to allow for adjustments within a reasonable range. Brown recommends choosing a bicycle frame based on the top tube, then adjusting the seat height accordingly. Which top tube fits you best largely depends on your torso height and your preferred riding style. If you enjoy a more upright position or your torso is on the shorter side, you want to look for a shorter top tube than someone preferring a low, slightly crouched riding style or a rider with a longer torso. A correctly sized top tube allows you to reach the handlebar comfortably with slightly bent elbows. Make sure to test ride a number of bikes with different seat tube/top tube ratios to determine which frame fits your body and your personal preferences best. When sitting on your bicycle, you should be able to place the balls of your feet on the ground. This will allow you to get your feet down and keep the bike up whenever you have to stop, but you will also be able to pedal conveniently and powerfully with slightly bent knees. You should be aiming at 80 percent to 90 percent of full extension, according to REI. If you are able to put both feet down flat, try a bigger frame size. If your feet don't reach the floor, try a smaller frame size. The size of the frame is a determining factor in the joy of riding your bike, but you also want to consider aspects such as frame weight. A heavy bicycle is harder to accelerate, and especially in city environments that require many stops, a lighter frame will add to your cycling comfort. Other factors to look at are the tube angles as well as handlebar shapes and stems. Allow room for adjustments when choosing a bicycle frame, and don't choose the largest possible size. Since riding habits change over time, you want to be able to move your seat or handlebar up or down when necessary. Also, a smaller bike frame is more sturdy than a larger one, which adds stability. Remember that bicycle frame sizes -- just like shoe sizes -- may vary, depending on the manufacturer, so don't just focus on a specific number tag. 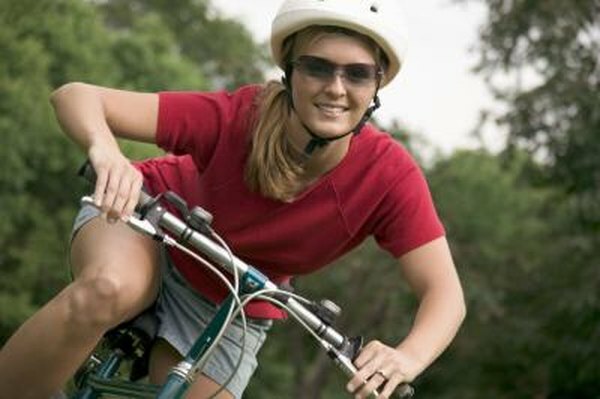 Opt for a specialized bicycle store over the bike-in-a-box warehouses or department stores. You will benefit from a knowledgeable sales associate's advice and a larger selection of bicycles when it comes to finding the right frame size for your body height and inseam.